3. Find a car seat. The Car Seat Finder is an easy-to-use tool that lets you do just that. 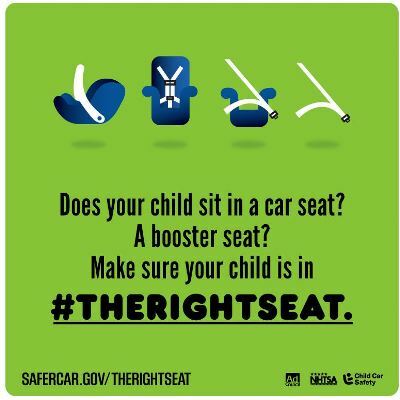 Simply enter your child’s birth date, weight and height above, and you’ll be provided car seat type results that fit your child according to NHTSA’s best practices recommendations. 4. Learn how to install your car seat correctly. This page offers videos and advice for the different types of kid car seats. Car seat inspection locator – Find a child car seat inspection station nearest you. Certified technicians will inspect your child car seat, in most cases, free of charge – and show you how to correctly install and use it. Search by state or by zip code. When Is My Child Ready for an Adult Seat Belt? – The time to transition your child out of a booster seat and into a seat belt usually comes when the child is between 8 and 12 years old.